Last week, we talked about making a plan for your novel. So, now that you have your plan figured out, it's time to finally sit down and start typing. The first Chapter has a really important goal: to get readers hooked in so they'll keep reading your novel. There are a lot of ways to hook readers. I love action movies, especially ones about a big heist. How do most heist movies begin? In the middle of a heist. It's a great way to show the viewer what kind of story they should expect while showcasing the main character in their element. The first chapter is your chance to showcase what your book is about. If you're writing about crime drama, political intrigue, or mysterious magic, then start out with that. You'll instantly entice exactly the readers who will enjoy reading your entire book. There's going to be something about your story that makes it special. If there's something different about the world your story takes place in, show it off in the very first scene. This is more straight forward in speculative fiction: there's magic, it's set on a space ship, or we're 1,000 years in the future. But even in stories set in the contemporary world, there will be something about the main character or central conflict that makes your story worth telling. Use that to engage readers. Another great way to hook your readers is to pose a question they can't get out of their head. The only way to sate their curiosity is to keep reading. There are also a few things that will make people put down your book before making it to page two. It was a lovely day. The breeze tousled the last few leaves left on the old oak situated in the center of the Yoder's backyard. Dark orange shades of the foliage contrasted with the white paint on the sides of the simple house.... yawn. It's really tempting to set the scene with beautiful flowery language, but don't. At the very beginning, no one cares about the oak tree in the Yoder's yard, and a lengthy description of a tree won't grab your readers. This is similar to setting the scene and is especially troublesome in speculative fiction. You've fleshed out this really cool idea of an alien world, and the first thing you want to do is tell your readers all about it. Don't. It's really hard to read through a long slog of description, and even harder to remember the important bits moving forward. It's best to intertwine world building throughout the story. Instead, tease the reader with a single unique detail about your world in the beginning and then they'll be excited to read more about the cool setting you've made. You never want to start at the beginning. Start when things start getting interesting. I read many YA novels when researching for The End of Refuge. One thing that would always make me put down a book was if it started with on the first day of school. Don't get me wrong, I loved school as a kid, but the first day of school is such a boring place to start. So why start there? My only guess is because it's what the author thought was 'the beginning'. Start when the main character runs into the vampire, realizes her best friend is a secret agent, or emits sparks out of his ears for the first time. Even the Harry Potter books, each of which followed an entire school year, didn't start on the first day of school. Rant over. There are other cliched beginnings to avoid, like the birth of the main character, waking up, moving to a new place, the apocalypse, etc. Now, I know I've put writing chapter one as the first step after coming up with a plan, but honestly, don't worry about drafting the first few scenes first. I usually have a hard time coming up with an awesome hook right from the start. 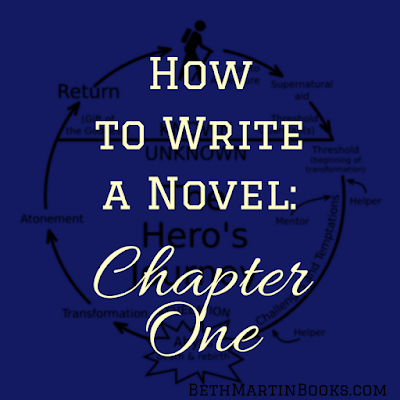 I'll usually start in the second or third chapter arena and come back to the beginning when I get an idea of how my novel should start. Originally, The End of Refuge started with Juliet getting to work a few minutes late. Snore. You bet I went back and changed that. Now the book opens to a fire. Sound exciting? Then read the book.